This is the second video in CleverHiker's Essential Trail Skills video series. This series is designed to teach backpackers of all levels the most important skills for the backcountry. Having an awesome adventure in the wilderness starts well before you step onto the trail. Planning successful trips takes time and practice, but it can also be a lot of fun. The first thing you’ll want to do is determine the goals of your trip and write them down. It’s important to make sure everyone in your group is on the same page about your trip goals so there aren’t any surprises. If you’re new to backpacking, it’s best to travel with an experienced partner or group the first time you head out. If you don’t have friends who backpack, consider joining an online group or choosing an easy trip for your first adventure. 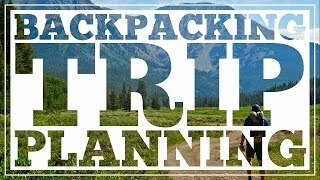 Solo backpacking trips can be just as rewarding as group backpacking trips, so don’t feel like you always have to hike with a crowd. But don’t strike out on your own unless you’re well prepared for the challenges of a solo trip. Accidents, mistakes, and poor judgment are all compounded when you’re on your own in the wild. When you’re searching for great backpacking locations, you can always start with a little online research. A few quick clicks will give you a lot of information about great backpacking locations your area. Google image searches will also give you a great idea of the pictures that others have taken in an area and how scenic the location is. Backpacking guidebooks are a fantastic resource for trip planning, location ideas, and much more. Money spent on guidebooks and maps is generally well worth the expense, especially considering how affordable backpacking is once you’re on the trial. If the dates of your trip are set in stone, search for locations that will be fitting for that time of year that you’d like to travel. Many high elevation locations will have trails covered in snow well into the spring and summer, so it’s important to know when the best travel times are. Once you’ve decided on a location for your trip and set some trip goals, it’s time to learn more information about that area and plan your route. Check online to see if the area you’re traveling in requires permits or parking fees. Popular locations may require permits to be secured weeks or months in advance. Also check on any specific regulations that the area might have well before your trip. There are may be regulations like campfire bans, bear canisters requirements, or closed sections of trail at certain times of the year. Once you feel like you have a good understanding of the area you’ll be traveling in, it’s time to plan a route for your trip. Start out by looking at simple two-dimensional maps of the area, and then take a closer look using topographical maps. Simple maps can often be found online and in guidebooks. They can be a great help when you’re trying to understand the general layout for a given area and the major highlights. A topographical map will give you a lot more detailed information and will be necessary for navigation on the trail. You can purchase them online, at outdoor retailers, and some ranger stations have them as well. When you start planning your route, have a general idea of the mileage that you would like to cover each day. Pay close attention to the experience level and physical ability of all members in your group. Planning a trip that is too difficult won’t be enjoyable and could put your group in danger. Take a close look at the difficulty of the terrain and the total amount of elevation gain over your trip. These two factors could greatly slow you down. Experienced backpackers traveling with lightweight packs can generally travel around 15-25 miles a day depending on the terrain. Beginner backpackers should plan on shorter days of around 5-10 miles until they feel more comfortable and experienced. You don’t have to hike 20 miles a day to have fun in the backcountry. Spending days with short hikes and a lot of downtime in camp can be very enjoyable. You might also find that exploring new terrain and covering a lot of ground with a lightweight pack can be very rewarding. So choose a daily mileage targets that fit with the goals of your group. Learn more about the benefits of lightweight backpacking here. Remember, hiking more miles during the day is not a function of hiking faster, it’s a function of spending more time on the trail hiking at a steady, comfortable pace. If you like to get up early and hit the trail, you’ll probably cover more miles than hikers who prefer a mellow start to their day with a warm breakfast. If you carry a light pack, you’ll probably need fewer rest breaks than hikers with heavy packs, which will also allow you to travel more. Remember, there’s no wrong way to hike, so choose whatever method works best for you and fits with your group’s goals. The average hiker covers about 2-3 miles per hour, which will help you to plan your daily mileage depending on how long you expect to hike during the day. Plan your route with a good idea of where you’d like to camp, but always leave room for flexibility. You’ll rarely find that you follow your itinerary exactly and it can be fun to make changes on the fly. Loop hikes are generally preferred, but can be harder to organize because the mileage will have to fit closely your daily mileage goals. Out and back hikes are also very common and can be a flexible way to travel, especially on shorter trips. Hiking from one trailhead to another is a way to avoid retracing your steps, but can add logistical difficulties, like needing to bring two cars or hitchhike. You could also consider hiking in, setting up a base camp, and doing day hikes to explore the area. That can also be a lot of fun. Pay close attention to water sources while you’re planning your route. You’ll need to know where to find reliable water along your trip and when you’re going to be traveling for long stretches without reliable water. If you’re traveling in a dry area, call a ranger station ahead of time to see how well the water sources are flowing. Put together a food plan well ahead of time and make sure everyone’s needs are met. It’s pretty common for every hiker to bring their own snacks but to share communal dinners. You’ll be burning more calories than normal on your trip, but you don’t need to go overboard. Try to bring an appropriate size of lightweight calorically dense foods. Make sure you have all the gear you’ll need for your trip at least a couple of weeks in advance. Always test your gear before you taking it into the field. Check out my favorite lightweight backpacking gear. Consider going on a one night shake down hike to practice using all of your equipment on a short trip before you go out on a longer backpacking trip. If you’re a beginner, see if you can borrow gear from friends for your first trip. Once you have some trail experience, it’ll be easier to know what you need and avoid spending lots of money on unnecessary gear. Always use a detailed lightweight packing list to ensure that you’re bringing the correct items for your trip. Forgetting a simple piece of gear like your headlamp or pocketknife can cause major problems. Compare gear with your hiking partners and leave behind items that you can share. Split up the weight of common gear to equalize pack weights. As your departure date nears, try to find out as much as you can about the current trail conditions in the backcountry to minimize any surprises you might face. You might find out about snow covered trails, forest fire closures, trail maintenance projects, washed-out bridges, and more. Sometimes it will be easy to learn about current trail conditions and sometimes it won’t be possible at all. Some areas have regularly updated websites and social media sites with current trail conditions and you can often learn about conditions by calling a ranger station or searching online forums. Sometimes there won’t be much information available at all, so you’ll just have to prepare as best as possible and be flexible with your route. When you head out on your trip, make sure to leave a detailed itinerary with a friend or family member. Let them know when you will be returning and make sure to contact them as soon as you get off the trail. You’re finally ready an awesome adventure and you’re as prepared as you’re going to be for your journey. Make smart decisions on the trail and you’ll have an incredible journey. As you get more experienced, trip planning will get easier and take much less time. You can add more spontaneous elements into your trips and explore areas making more decisions on the fly. However you choose to travel, a good trip plan will make all the difference in how much you enjoy your adventure.